Samsung is quite popular for releasing every possible version of their products now they move one step forward with galaxy Tab 3 8.0. 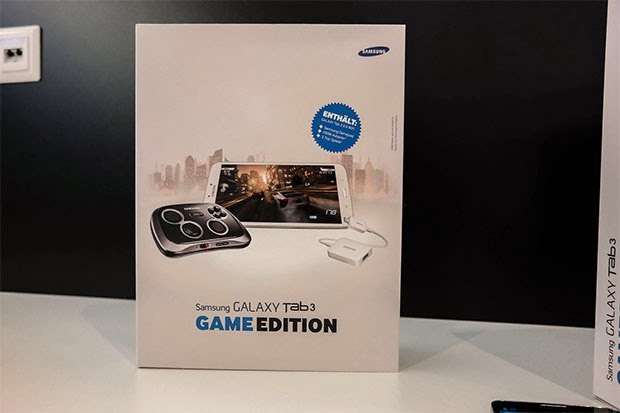 The company announces that they will sell special Game Edition of the Galaxy Tab 3 8.0, which comes bundled with the Game Pad accessory and an HDMI adapter. This HMDI adapter will connect your Galaxy Tab 3 8.0 to a TV as a console and you play from a distance using the Game Pad which connects over Bluetooth 4.0. Samsung will sell the Game Pad separately for €80 and the HDMI adapter for €20. So you can virtually connect any Galaxy devices with it. You only need to ensure your device is running Android 4.1 Jelly Bean or higher. The Game Pad can hold phone ranging from 4″ to 6.3″, it cannot hold tablets, not even 7″ ones. There’s no word on the price of the bundle yet. Germany will be one of few countries where Samsung going to release it first.